We are merging all of the various "For Sale" threads to keep the General Dog Chat area a little more tidy. Any items you wish to sell or are looking for, post them here. All new threads added to the forum with "for sale" or "wanted to buy" type items will be merged to this thread. I'm in the middle of ordering this collar's replacement as I type this. Haha. FOR SALE: The Patrick Deluxe, 3/4", in brown and brass, 10-12". It's too big for my chihuahuas, and Tucker normally wears this one. I need to get him a replacement for a 9" neck. 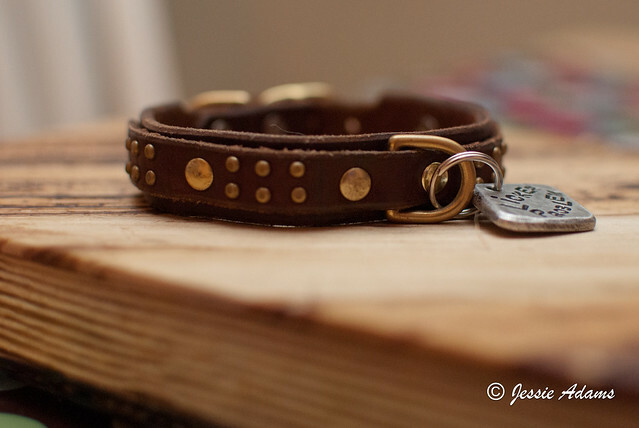 The collar is $80 + $12 for shipping from Paco Collars, and I will let it go for $60 shipped. I've owned it for 6 months. It's the 3rd one down on the left pile. I wish sooooo much that it would fit Frodo. If only it was a little bigger! Definitely won't fit anybody here. The fit is VERY close on the tightest hole for Chloe- so if it doesn't sell in the next day or so, I'll just keep it since it's a really nice collar. I already have a custom design in the works for Tucker, and he'll wear this one until it's done. It's a little loose, not loose enough for him to not wear it (which is why it's been his collar for the past 6 months). Guess it's too big for a kitty, huh? 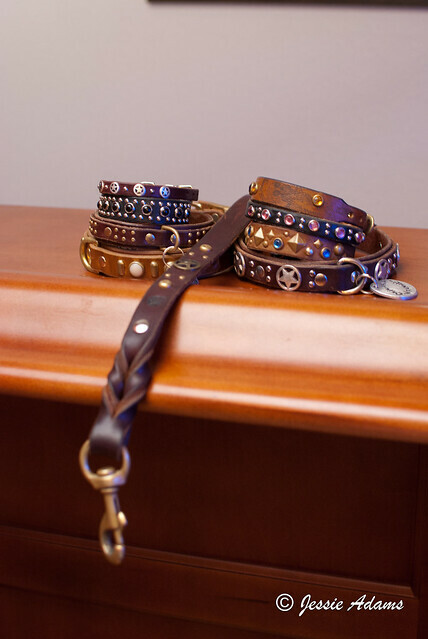 I've been wanting to get Rock a Paco collar but Ryan says I'm crazy. Same here. I SO want this for Jake. You all need to shrink your dogs necks! I ordered Tucker a very adorable new collar tonight... If this doesn't sell, I'll just hold onto it since I really don't want to drop the price. It may work for a kitty. My largest chi weighs 7.5lbs and this is still almost an inch too large for her. I'll post up a better pic tomorrow. I'm on my phone at the moment. This is the exact same size of the collar I just sold... the one that Talla outgrew. Does anyone by chance have any Fetching Tag gift card codes they aren't going to use? A friend of mine is looking for some for her retiring service dog, so I figured I'd make a post and pass them along to her. I know I've let some expire without using them, so I'm hoping there are others who aren't planning on ordering and would rather see their codes put to use. I'm pretty sure they can only be used by the person they were sent to, but I could be wrong. For Dana? Hope she finds some! I've given a code away before and it worked fine . The gift card codes can be combined. You can combine them, I did for Jin's tag. I do have a code now, but am hoping to use it myself, asked already if anyone had some they weren't going to use but didn't get a response, so I'm probably going to have to settle for a skinny for Enda. Collar Mania Collar for Sale! I'm selling my CM collar. It fits both my 13" and 16" neck dogs, 1" wide. Great condition, some ware is visible. Rarely worn. They wore the collar in the house for the first couple weeks, but that's it. Like Jessie, I've come to the conclusion that I just prefer leather, even though fabric is very pretty! Paid $18 + $6 shipping, will sell it for $18 INCLUDING SHIPPING. 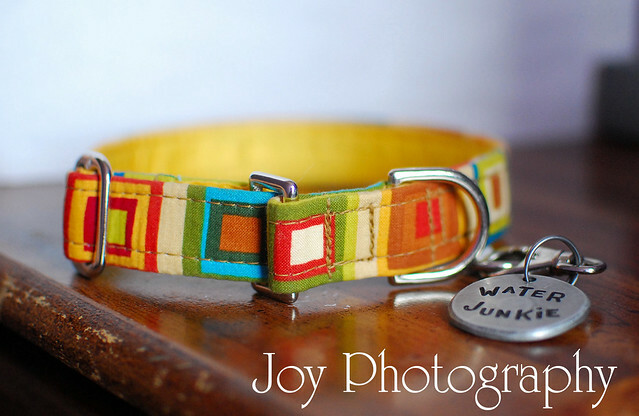 Oooh that's Snipe's color (yellow), but I just bought a couple of collars - argh! Do you take paypal? I might have enough of a balance in Paypal to swing it. No, I don't have paypal. Sorry! If you'd like it, I'd be glad to hang on to it for a week or so till you could send cash or check.